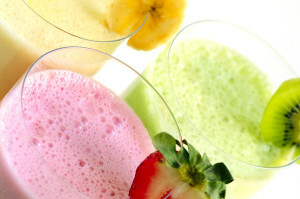 What could be better on a hot summer day than a fresh fruit smoothie? Smoothies are easy to make and can be used as a meal replacement or as a snack. The difference is in the calories. So pay attention! 200 calories is a snack. 400 calories is a meal. In most cases, the banana is the “meal-breaker”. If you add one, it’s a meal. If you delete the banana, it’s a snack. Here are a few of my favorites. Add ice if you like it thicker. Blend. Don’t let this sit too long or it will thicken. So drink up and enjoy!